7 days to go – right now I should be in peak physical condition. Instead I’ve got a streaming cold and a pain in my bum. The cold will take its course – I can believe that will go. The pain in my bum, well it’s sciatic pain – wickedly good when I cough or sneeze. I’m sure it’s because I haven’t taken care of stretching my glutes, so some foam rollering and some glutes stretches are order of the day. The major downside of the cold is that I’m missing out on sessions in the sauna – really important for getting my body ready for the higher temperatures in the desert. All in all not ideal, but I still know I can complete the distance, I might just have to take it a bit easier than I hoped. I’m pretty organised with my kit, a few bits to finally sort out – needle and thread, some Pepperami wideboys that sort of thing. In general though I’m pretty happy. My total kit without water is going to come in around 7.5-8kg on the start line. Which is about where I wanted to be. Much closer on the weight limit of 6.5kg would mean I’d be calorie light – so this is a good compromise. I got my medical certificate signed off. Due to the nature of the race an ECG is needed as well as a general check over from the GP. Despite it showing up some abnormalities my doctor was happy enough to sign me off as ok to go. The unusual trace shows Sinus brachycardia compatible with a bundle branch block, left ventricular hypertrophy with wide QRS and an insignificant Q wave in high lateral. Basically, compared to the normal person, I have a big, slow heart – quite common with people who exercise. Makes sense, running needs a big pump. I also managed to get a short test in with my gaiters and shoes on some lovely, hard dunes. Really not looking forward to day 1 of the event…there seems to be a lot of dune work to come! I wouldn’t class myself as a sophisticated user of training aids like HR monitors and GPS. I know what I’m looking for in HR zones, and I like to see elevation profiles and distances covered. But I’d be lying if I said I was a slave to my watch. One of the things that I enjoy about running long distances is running to the feedback my body is giving me. I find occasionally that when I run to a watch I’m looking at the pace constantly, and that sometimes takes away my enjoyment. I’ve had a Garmin Forerunner 305 for a long time, and I love being able to switch it easily between a bike and my wrist; but it has a relatively short battery life for multi day races. I’ve also had a Suunto Vector for over a decade, and I love navigating with this. I had assumed I wouldn’t be logging my Marathon des Sables run because the run time is likely to be around 30 hours. Enter the Suunto GPS pod. At 55.5mm in diameter, 18mm thick and weighing in at just 35g this is my kind of size technology! Add to this one button and a battery life of either 100 hours or 24 hours depending on how often it takes a position fix and this looks like a serious tool for tracking movements outdoors. Supplied with an elastic armband, it can also be attached to any strap by removing the ‘ring’ and reattaching it with the material trapped. Or, as I have tried just dropping into a pocket that has a good view of the sky. The Suunto interface, Moveslink is easy to use and changing settings on the pod really easy to do. There are only a few variables- how often a fix is taken (1 second or 1 minute) and whether the GPS automatically starts taking a fix when it’s turned on, or whether you start it with the big red triangle button. There is also the ability to turn the audible notifications on and off, but the little beeps are so quiet I don’t know why you’d switch them off. Two lights tell you whether there is a GPS fix and how the battery is doing, and that’s it really for the unit. Recharging is taken care of by a crocodile clip style USB lead that also attaches it for data transfer. A nice touch is knowing the state of battery charge to 1% through Moveslink. First charge took about 3 hours and keeping it topped up now is easy every two or three runs. Turn it on and track your position. It integrates with other Suunto watches, but I can’t comment on pairing as I haven’t tried it. I expect it too is a very simple process. As a committed Strava user I wanted to compare Movescount. There are lots of things that are good about both platforms. Categorising is easier on Movescount, and I think the uploading process is a little easier than my wired technology on Strava. Graphically I prefer Strava, and as I’ve said in previous blogs, the Strava segments are a great motivation and performance check. Exporting moves from Movescount is easy, with a variety of format types available. Exporting as a .GPX means that Strava can be easily uploaded too. This is what I do. I wanted to see the effect of 1 minute fixes, and whilst the tracklog is good, the effect of uploading a .GPX to Strava seems to confuse it. Looking at Strava and Movescount side by side with a 1 minute fix shows that Strava thinks you’re stationary for a lot of the time between taking fixes and this means that the pace data is flawed. This example shows a session time of 2 hrs 16 minutes on Movescount, where Strava shows 49 minutes. Interestingly Movescount shows a much greater elevation, and Strava is correct on this one. Switching the fix time to 1 second makes the two agree much more closely on elevation. The moving time discrepancy seems to large to me for opening and closing gates. Digging a bit deeper in the .GPX file it seems to be where in deep woodland there are a couple of minutes here and there where fixes didn’t happen. This would happen with most receivers. As with all electronics there is a wide spread of prices available on the web. The RRP is £100 and at this price the unit is an excellent way to store any of your adventures. Because the unit doesn’t give any data on position, I can see on Navigation events, such as the OMM it is a realistic way to log your track without gaining an unfair and rule breaking advantage. If you want to accurately log your position for long days, or multi days this has to be the bit of kit to take. I’ll be taking this little unit to the Sahara to log Marathon des Sables. You’ll see the results by the end of April. Details, details – passport numbers, final kit checks, sore bits. Definitely taking up a lot of my thoughts at the moment. 21 days to go. Trying to control the doubts. Pete’s death of melanoma started the process of seeing Marathon des Sables on Trans World Sport some 25 years ago. An inspirational challenge that I saw as well beyond my ability. And tomorrow I’m 40, and that isn’t a milestone. I’m thinking my Dad would have been 67 (we shared a birthday) and this birthday will be the 20th one without him. I think of my Mum’s 40th birthday – her hair just growing back after chemotherapy and her last but one. Cancer killed my parents half my lifetime ago. I know how cancer smashes through lives. The summit of Foel Offrwm. We all hope it won’t be us, but it will, the statistics say so. And melanoma, that’s the cancer of our generation – those born from the 60’s – 90’s. When in the 50’s every one smoked and then Lung Cancer was a battle 20 years on, “we” in middle age now are going to have to deal with Melanoma. Research is speeding up, cures are getting better. But we’re still behind on what is preventable. What are you going to do? I’m going to run across the desert to raise money and awareness. A good deal of catharsis too. Last night I took my daughter up a hill for a beautiful sunset. Walking. Running. Slipping. Sliding. Laughing. Living. When it’s gone, its gone. All those donating more than £10 to my JustGiving page received before 31st March will go into a draw for a half day coaching session with Andy Mouncey. This prize is worth £189 and includes accommodation with Andy in Bentham, Lancashire if the winner wants it. Andy has represented GBR in triathlon and has raced Ironman distance five times. He has set stage records for Arch to Arc – a 300 mile solo triathlon from London to Paris and has a whole host of ultra running achievements to add in. Andy has authored two great books, “London to Paris the hard way”, “Magic Madness and Ultramarathon Running” – both are available to buy on his website here. Whilst his website BigandScaryRunning.com is a terrific resource, some one to one coaching time with Andy will help you with things such as specific problems, making a breakthrough or getting ready for your first Ultra. We’re very grateful that Andy is has donated this fantastic prize to raise money for Myfanwy Townsend Melanoma Research Fund. Thank you Andy. If you have already donated or I don’t know you personally as someone who would enjoy the coaching, please add “AM” to your donation message to be added to the draw. Monday started with a “mayday” call to Martin Like of Likeys. 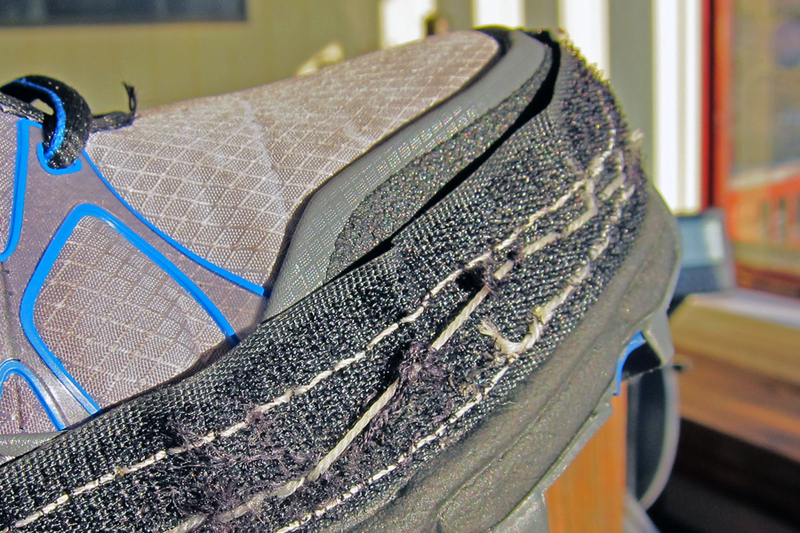 Having decided that a local cobbler was the right way forward for attaching my sand gaiters to my trainers – the results were less effective than expected. There are a couple of slices right through my shoes now, big enough to get my finger through, so sand might be a little more successful getting in than I hoped . Having bedded these shoes in, I was very confident that, as long as I could keep the sand out, these shoes would be my best bet for avoiding large blisters – which though pretty much inevitable I was hoping to minimise. Martin is a veteran of a huge number of Ultra, multi-day stage races, and his advice was well received. I’m going to do my own gaiters this time, and have managed to run my new shoes in this week too. ECG done this week too; this means I have two bald patches on my hairy chest. My daughter thought I should shave the rest off – and a few other suggestions of waxing from various people. I had thought this would be another way to raise some money, but a few people have let me know that the ingrowing hairs I would suffer would be painful. On top of running in a hot desert, a pus filled chest is not another thing I need to add! – Ben Hogan. Every shot in golf is separate, and smelling the roses is about separating each shot you play, so that every one is as good as you can make it. I’ll be trying to do the same in the desert – one good minute doesn’t mean that the next one will be the same – but enjoy it while you can. 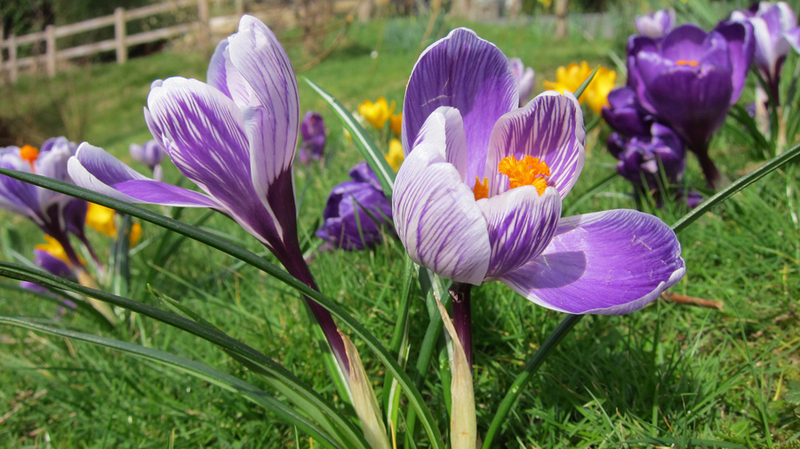 Not quite roses, but the crocuses were looking brilliant this week. Despite being successful in getting through the application process to the selection process for being an ashmei ambassador, I couldn’t make it to Hertfordshire this weekend for the workshops and final selection. I wasn’t alone in this, ashmei offered us the chance to make a 60 second video to capture our achievements and goals – there was a suggestion it could be fitted into a 15 second Instagram clip; I have no clue as to how I could have done that! I received some absolutely amazing donations this week – from all round the world, the US doing particularly well in the donation league tables. But Wales also doing fantastically with some very special donations from Pete’s family and Meirionnydd Running Club . Just Giving is creeping the way it needs to – up! And finally, with the weather picking up, it was an absolute pleasure to get some miles into my new trainers and to do my final, long run before heading out to the desert. A beautiful run on some new tracks to new places, joining the dots in different ways. Life is good when plodding away through the hills around home. I’m hoping the coming week is a little less fraught, though with a four year old in the first day of chicken pox, I suspect I’ll need to smell some more flowers! Whilst I’ve got a few niggles I’m looking at different ways to do some training – this is a nice bit of variety – Rhobell Fawr, late afternoon, crystal clear skies…big heavy vest. Sorry for the wind noise!